Tokyo subway passengers had their suspicions confirmed yesterday when a male gaijin stood up from his seat as the train pulled up to Roppongi Station. 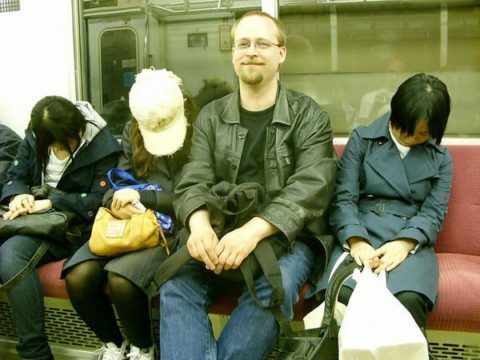 “I had a sneaking suspicion he would get off at Roppongi,” said one commuter. The carriage collectively held a quiet thought of self-satisfaction as the man stepped out of the train onto Roppongi Station platform. “Let’s be honest, I knew it, the whole carriage knew it, who did he think he was kidding?” said another passenger from Chuo Ward. The incident confirmed long held assumptions by many in the carriage of the downright sordidness of Roppongi after dark. LOL, you should call this The Negi. Great satire, keep up the good work! As the guy who wrote the satire page “The Negi” for metropolis magazine I have to say I am consistently impressed by the level of quality stuff wasabi produces. Truly awesome. You guys rock!